Estates or station wagons are known more for their practicality than outright performance. If you’re looking for a fast luxury car priced between Rs 55 lakh to Rs 75 lakh but want a three-pointed star on the nose, Mercedes-Benz offers its most popular model in two different iterations - the E 220 d long wheelbase sedan and the All-Terrain 220 d rugged station wagon. 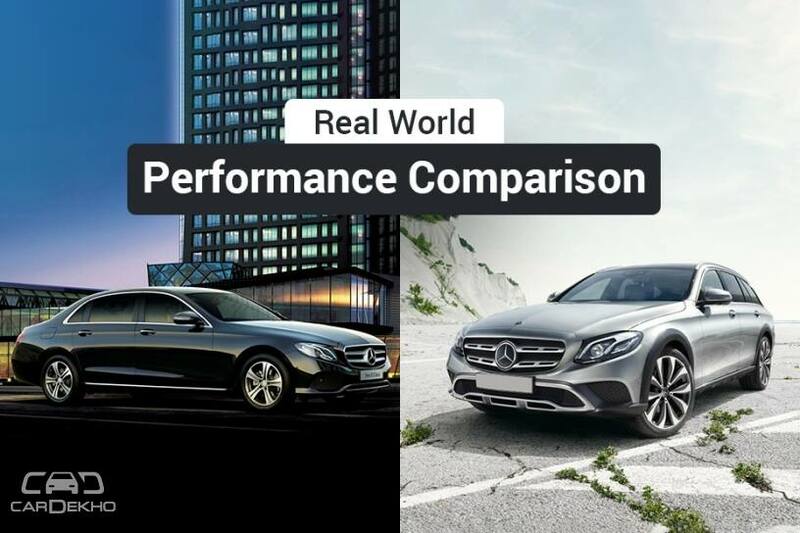 To find out which of the two offers better real world performance, we compare their specifications, acceleration, braking and the all-important fuel efficiency. Both cars are powered by Mercedes’ OM 654 2.0-litre, 4-cylinder BSVI-compliant diesel engine which belts out 194PS @ 3,800rpm and 400Nm @ 1,600-2,800rpm. Transmission duties are handled by a 9G-Tronic 9-speed automatic gearbox unit. But the E 220d All-Terrain gets Mercedes’ 4MATIC all-wheel drive system and a raised ride height to take on the country’s rough roads. Does the estate body shape and all-wheel-drive affect the performance of the All-Terrain? Let the test data answer that for you. As expected, the sedan is .82 seconds faster than the estate from a standstill to 100kmph. Even in the kickdowns, the rear wheel driven sedan is a sixth of a second faster at 4.92 seconds. That said, the differences in the performance are minor and the E 220 d All-Terrain is still plenty quick for our roads. The reason for the sedan edging past the estate is the latter’s higher set roofline and 20mm higher ground clearance, which affects the aerodynamics. But it’s interesting to note that despite a higher drag coefficient, the All-Terrain offers better fuel efficiency not only in the city but also on the highway. And we know of no one who doesn’t like a frugal car. When it comes to dropping the anchor, the E 220 d All Terrain lags behind its sedan sibling once again. This could be due to its higher weight of 2570kg. In comparison, the sedan weighs 1810kg. As a result, it stops around 3.5m to 4m later than the sedan. The E 220 d is priced at Rs 59.64 lakh while the E Class All-Terrain gets a sticker price of Rs 75 lakh, making it Rs 15.36 lakh more expensive than the sedan. Now, bear in mind that this is a pure performance comparison and both of these cars are completely different vehicles in terms of design as well as the purpose they serve. So would you pick up the E Class All-Terrain for the added practicality over the sedan despite the performance deficit? Let us know in the comments below.